Tiny Homes have become an ever more popular notion for those looking for a small but perfectly formed house. But what if you’re more of a water dwelling person? 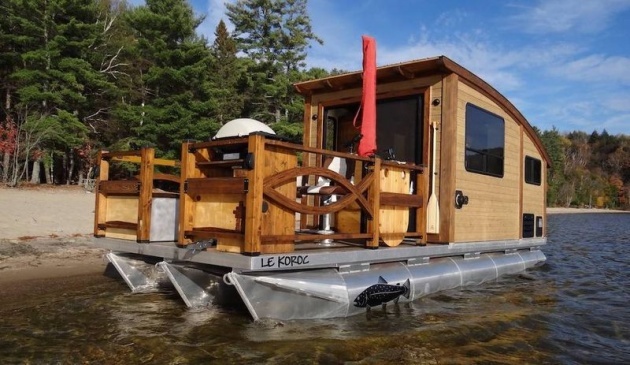 Well, you’re in luck because Canadian workshop Daigno have just announced Le Koroc, their very own Tiny Boat House. Whilst house boats are, of course, nothing new, chances are you won’t have seen anything quite like this Daigno Le Koroc Tiny House Boat before with its striking visual impact and highly innovative design processes which really makes the most of the available space. The flagship product of Daigno, the Le Koroc Tiny House Boat uses clever construction processes and a single-structure laminated timber, which is testament to the Canadian workshop’s constant consideration for the environment throughout the build.